The Japanese Cards of the Day for May 24th, 2018, are the first Common out of V-Extra Booster 01: The Destructive Roar, Funky Bazooka, and the four Origin Rares from V-Booster Set 01: Unite! Team Q4, Blaster Blade, CEO Amaterasu, Dragonic Overlord, and Asura Kaiser. 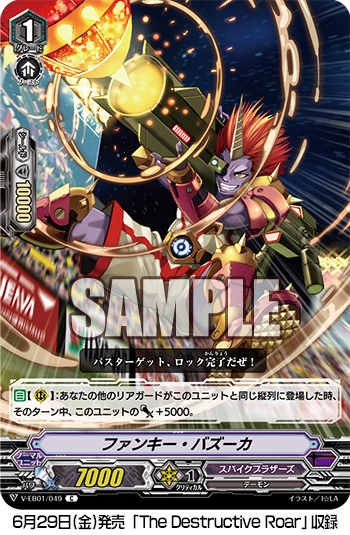 Bazooka is a powerful supporting grade 1 for Spike Brothers, a clan which emphasizes sending its rearguards back into the deck after they've attacked and superior calling to open rearguard circles mid-battle phase using one-for-one exchanges rather than plusses. The essential template for the clan since it was first fleshed out in Onslaught of Dragon Souls is to attack with units that send themselves back into the deck, then use a vanguard that superior call those same units out mid-battle phase. In 2011 this was Juggernaut Maximum and Highspeed Brakki paired with General Siefried, with Maximum swinging 16k (equivalent to an 18 today) for soulblast 1 and Siefried superior calling any grade 2 or greater units he drive checked to open rearguard circles. In 2012 Siefired was replaced by Dudley Emperor, who instead paid counterblast 2 on-attack to send two cards from hand to soul and search the deck for two units. Thus the gameplan was to swing 14/16 with Brakki/Maximum, return them to deck, and use Emperor's Limit Break to bring them right back out to swing 21k boosted. Dudley Emperor became the template for all future Spike Brothers boss cards to live up to--Grateful Catapult, Bloody Ogle, Rising Nova, and others. With these kinds of strategies in mind, Funky Bazooka's skill helps build up for the final attacks of the turn and ensure the opponent is staring down the most powerful column last. Funky doesn't care if the cards are called from an effect or just called normally, and so can become a 17k booster with just one normal call and one superior call. If Spike Brothers get a new unit like Frozen Ogle, who can search and call after attacking, Funky has the potential to rack up those +5s over and over up to 37k. With Spike Brothers confirmed as a Force clan, the Gift Marker ensures boosting won't be necessary to reach high power levels quickly, and every new card called will benefit from the Gift. Take that 37 boost, factor in two Force Markers, and a Juggernaut Maximum remake that gets 10 instead of 5. Bloom. The four Origin Rares have already been discussed at length in many previous articles, and there's no need to repeat these statements at this time. Instead, look to the distribution of Origin Rares: it appears to be two per case based on early openings, making these as rare as Special Parallels were in the BT01 days. Worth noting is that while Vanguard Rare and Special Vanguard Rare prints seemingly go to set cover cards by default (usually but not always manga bosses) ORs instead go to the faces of the first season. 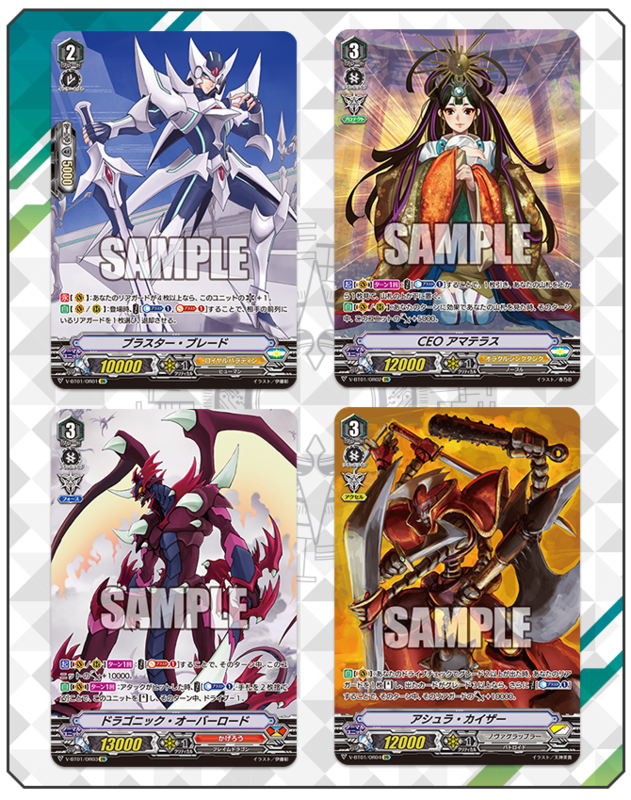 Based on this information, with Siefried, Hercules, and Gigarex as the cover cards of EB01 and thus its most likely VRs, the remaining ORs for 2018 would include at least Deathrex, Amon, Voidmaster, base form Daiyusha, and Maiden of Trailing Rose. Others are harder to pin down due to unclear clan identities early in the game's history--Hell Spider, Giraffa, and Machining Stag Beetle were each the "face" of Megacolony at different points in 2011, while for Pale Moon it was a toss-up between Barking Manticore, Alice, Robert, and the grade 2 Crimson Beast Tamer. Exactly where Standard format will take each clan is unclear, but so far we've seen generally-focused support with few alternative deck options. Only Nova Grappler has had multiple distinctive deck types, with Perfect Raizer, Asura Kaiser, and the Hero deck each having some overlap but with preference given to their respective exclusives. The previous Japanese Cards of the Day were Cat Butler and Blaster Blade.